Looking for a job in Okeechobee County Florida? 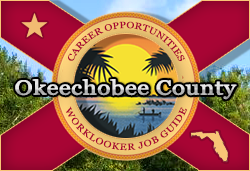 This Okeechobee County Florida job guide is a resource for job seekers looking for legitimate employment opportunities in the region with an emphasis on government positions, top healthcare employers, public school careers, and major job boards. Okeechobee County Florida frequently posts opportunities. Open positions found on this review date had included Administrative Secretary, Building Maintenance Technician, Electrician, Equipment Operator, Equipment Operator Driver, Field Appraiser, and Mental Health Court Case Manager. Also, the Sheriff's Office provides applications for certified and civilian support staff positions. Check for current listings. The City of Okeechobee may periodically post job openings. During review there had been an announcement that they were currently accepting applications for fully certified or auxiliary certified officers. Lykes Ranch was accepting applications for Ranch Hand, Forestry Manager, Land Manager, and GIS Coordinator. Be sure to check their site for the latest listings as they are being updated. Walpole Inc. is a family-owned and operated dependable carrier located in Okeechobee. Walpole hires drivers and for non-driver positions. Raulerson Hospital is a 100-bed, acute care facility dedicated to providing local access to a full range of high quality, comprehensive medical care and surgical services. A survey of open positions found included Medical Technologist, Laboratory Assistant PRN, Storage Records, Registered Nurse RN Emergency, Paramedic, Staff Technician PRN, Floor Care Technician, Patient Care Assistant, Registered Nurse Emergency, Speech Therapist, Speech Therapist PRN, Echo Technician PRN, Registered Nurse RN Medical, Registered Nurse RN Operating Room, Registered Nurse Intensive Care Unit, Operating Room Scrub Technician PRN, New Graduate RN Registered Nurse, Clinical Dietician PRN, Registered Respiratory Therapist, Cat Scan Tech, Operating Room Scrub Technician, Pharmacist PRN, Physical Therapist PRN, Medical Technologist, and Cat Scan Technician. Okeechobee Health Care Facility is one of the top-rated rehabilitation centers in Florida, and a 5 Star Skilled Nursing facility as well. During review there were open positions available for Cook, Registered Nurse & Licensed Practical Nurse (RN & LPN), Certified Nursing Assistant (CNA), and Physical Therapist. Legacy Behavioral Health Center, Inc. is a community mental health center that has been serving residents of Martin, Okeechobee, St. Lucie, Indian River and Palm Beach Counties since 2005. Visiting Nurse Association of Florida periodically hires for positions such as Home Health Aide HHA, Occupational Therapist, and Registered Nurse RN. Brookdale Senior Living had listings in Okeechobee for Social Worker, Physical Therapy Assistant, and Registered Nurse Home Health Paid Per Visit PRN. Okeechobee County School District bright, enthusiastic, and committed teachers and support staff. During this review there were a large volume of employment opportunities available. Open positions found had included Elementary Paraprofessional Jobs, Elementary Teaching Jobs, Gifted Teacher, Language Arts Teacher, School Secretary, Bookkeeper, ESE Paraprofessional, Custodial Jobs, School Custodian, Art Teacher, Math Teacher, PE Teacher, School Bus Driver, and more. Indian River State College Dixon Hendry Campus may periodically have openings. Chamber of Commerce of Okeechobee County can be used as a resource to use for exploring area businesses, economic climate, workforce information, cost of living, and more. This is a great jobs resource for job seekers. Jobs can be found such as Behavioral Health Technician, Case Manager, Cashier, Mechanic, Waiters and Waitresses, Police Officer, Licensed Practical Nurse LPN, Clerical Jobs, Medical Assistant, Store Manager Restaurant, Therapist, Youth Care Worker, Retail Jobs, Sales Associate, Registered Nurse RN, Computer/Network Technician, Licensed Mental Health Counselor or Licensed Clinical Social Worker, Customer Service Associate, Records Clerk, Dispatcher, Hospitalist, Medical Technologist II, Counselor, 3rd Grade Teacher, Bank Teller, and more. This Worklooker directory includes St. Lucy County Sheriff's Office Careers, Fort Pierce City Employment, St. Lucie Clerk of the Circuit Court Employment, Port St. Lucie City Employment, and more. This Worklooker directory includes the City of Sebring, Avon Park, Highlands Regional Medical Center, Highlands County Public Schools employment, and more. This Worklooker directory includes The City of Stuart opportunities, Martin Memorial Hospital, Martin County Public Schools, and more.